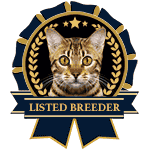 Before you contact us, please review our Buying Process page and our Available Kittens page as this will answer almost all of your questions! If you still have questions after viewing these informative helpful pages, Please feel free to contact us! Leaving a phone number will ensure a quicker response!